( Updated on 20th April 2019: ZeptoLab has posted Episode 112 (Om Nom Stories - Super-Noms: Neighbours' War (Cut the Rope) - Season 12 Episode 2 !). I think so far the cutest videos would be the 1st one posted long time ago on 9th December 2011 (now named as "Original Episode") and "Episode 3 (Favorite Food)". (1) Episode 1 (Strange Delivery) - has the same name as the 1st few issues of "Cut The Rope: Comic", an app-based comic series released many months ago for the iOS platform, read: NEW "Cut The Rope: Comic" in App Store. (2) Episode 2 (Bath Time) - has the same name as the 5th box of "Cut The Rope: Experiments". (3) Episode 6 (Magic Tricks) - the hat used in the video looks the same as those hats you see in Magic Box (4th box) of "Cut The Rope". (4) Episode 10 (Robo Friend) - the new device introduced in the 6th box "Handy Candy" of "Cut The Rope: Experiments" is a robot's arm, I think they purposely created this story about Om Nom meeting a robot and the robot "handing" out some "candy" to him at the end of the video. (5) Episode 11 (Time Travel) - a shorter version of this video is shown when you play the 1st level of "Cut The Rope: Time Travel". (6) Episode 12 (The Middle Ages) - has the same name as the 1st box of "Cut The Rope: Time Travel". (7) Episode 13 (The Renaissance) - has the same name as the 2nd box of "Cut The Rope: Time Travel". (8) Episode 14 (Pirate Ship) - has the same name as the 3rd box of "Cut The Rope: Time Travel". (9) Episode 15 (Ancient Egypt) - has the same name as the 4th box of "Cut The Rope: Time Travel". (10) Episode 16 (Ancient Greece) - has the same name as the 5th box of "Cut The Rope: Time Travel". (11) Episode 17 (The Stone Age) - has the same name as the 6th box of "Cut The Rope: Time Travel". (12) Episode 18 (Disco Era) - has the same name as the 7th box of "Cut The Rope: Time Travel". (13) Episode 19 (Wild West) - has the same name as the 8th box of "Cut The Rope: Time Travel". (14) Episode 22 (Forest) - has the same name as the 1st box of "Cut The Rope 2". (15) Episode 23 (Sandy Dam) - has the same name as the 2nd box of "Cut The Rope 2". (16) Episode 24 (Junkyard) - has the same name as the 3rd box of "Cut The Rope 2". (17) Episode 25 (City Park) - has the same name as the 4th box of "Cut The Rope 2". (18) Episode 26 (Underground) - has the same name as the 5th box of "Cut The Rope 2". (19) Episode 27 (Fruit Market) - has the same name as the 6th box of "Cut The Rope 2". (20) Episode 28 (Bakery) - has the same name as the 7th box of "Cut The Rope 2". 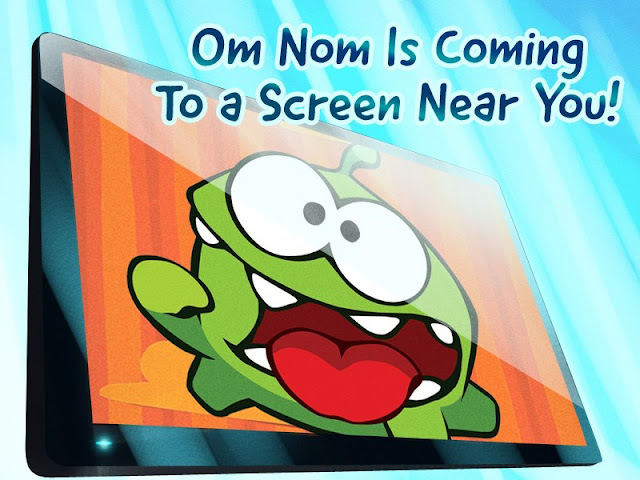 Below is a set of NEW videos for "Om Nom Stories". At the end of each episode (video), there's a question asking you to find a "hidden star", "hidden object" (Seasons 4, 6, 8, 9, 10, 11 and 12), guess the "country" Om Nom is in (Season 5) or guess "Om Nom's next job" (Season 7). I decided to include these as puzzles under Puzzles and you can view the answers in Answers. We found all the stars, but when clicking on it, nothing happens. How do I click the star?